The last few days were miserable weather wise, with temperatures ranging from 46 to 48 degrees centigrade combined with hot winds (loo), making one feel positively ill. It not only is an energy sapping phenomenon but also a mind-frying one. The refrigerator is also not working as well as it should, which means food is going bad at a much faster rate. Looking at the state of the fruit in there, it was better to use them up as fast as I could in whatever way I could. My popsicle making spree started by accident. I tried to make a cherry jello, but because I probably put too little gelatine in it or the fridge didn’t pull its weight, it didn’t set well, so thought instead of wasting it, let me make it into a popsicle. That went down very well with the kids and got my son excited enough to start making his own lemonade popsicles, minus the gelatine! Then there were watermelons. One of them was a bit dry and did not taste too good on its own, so I thought why not make a popsicle out of that too. It came out beautifully. I had to add sugar to this batch as it was not as sweet as it should be but you can omit the sugar if you feel your watermelon is sweet enough. Add the lemon juice though. It gives a lovely contrasting flavour to cut the sugary sweetness. This is a wonderful activity you can participate in with your children. The health benefits of home-made anything cannot be debated and it’s fun and engages the kids, even absolutely uninterested-in-cooking types, like my son. The guy who will not come near the kitchen otherwise, was all excited to make his own permutations and combinations because it’s just that easy and fun. After successfully making his lemonade popsicles, he started thinking he’s a masterchef – ‘Mama, I’m as good as you at cooking now’. Yeah okay. I hope you will try out some of these at home. You get a yummy treat with a side benefit of family bonding. Use any fruit you want. If you’re using cherries or lychees or fruit other than watermelon (which in itself has very high water content) you will have to add an equal amount of water while blending them to get the juice at the right consistency. Sugar amounts will also vary depending on the type of fruit. Enjoy! Smack the watermelon cubes in a bender till absolutely smooth. Strain the juice in a sieve into a bowl. You don’t want to use a sieve thats extra fine or one with too-large holes. Just enough so that most of the thick fiber remains in the sieve. You should get 300 ml of juice. Add the sugar and lemon juice to the watermelon and mix till thoroughly incorporated. If your watermelon is very sweet, you can omit the sugar if you like, but a popsicle should taste sweet and one tablespoon of sugar is not that much. 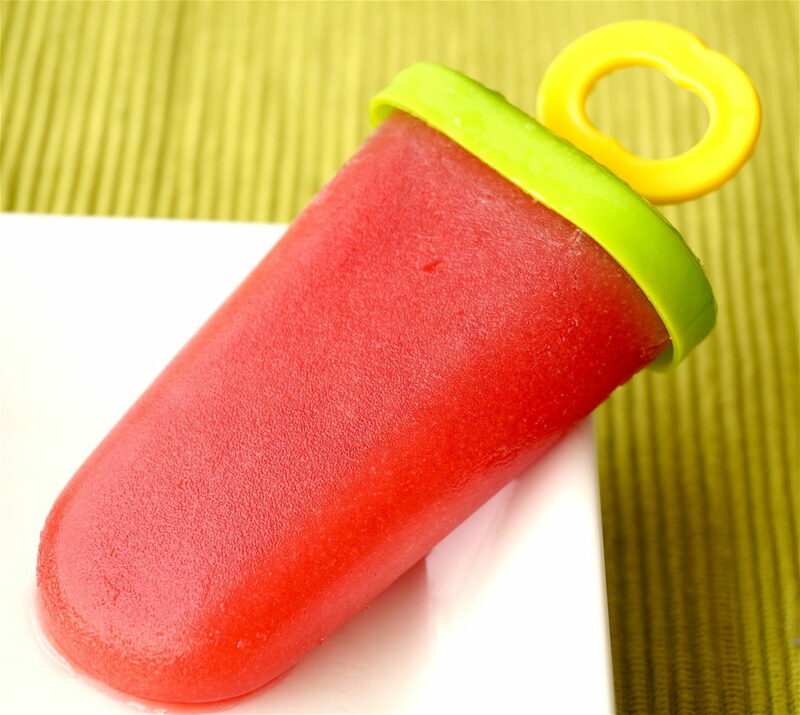 Pour the juice into popsicle moulds and freeze for at least five hours. 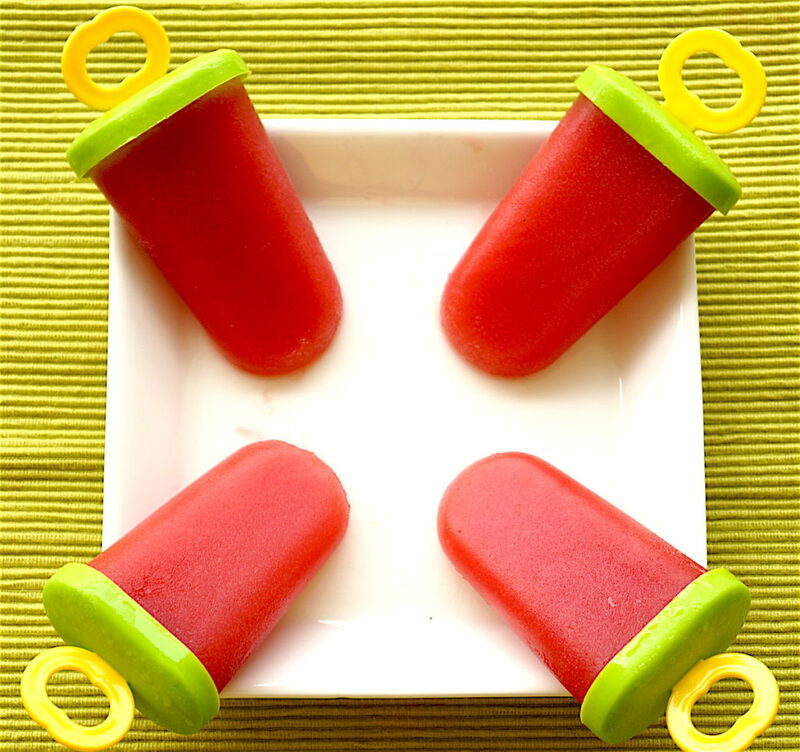 If you have large moulds, you will get four popsicles. If you have medium sized moulds, you will get will get five. Enjoy your guilt-free, artificial colour-free, excessive sugar-free, preservative-free treat.